This month’s Park of the Month is Coffin Bay National Park on southern Eyre Peninsula. 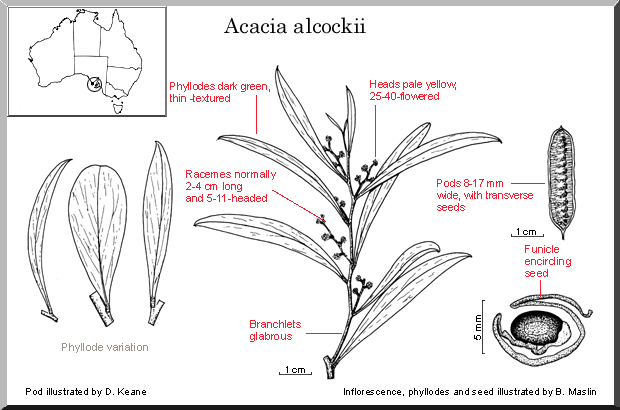 The State Herbarium has chosen Acacia alcockii Maslin & Whibley (Alcock’s wattle) as the Plant of the Month, as the species is endemic to southern Eyre Peninsula. It grows in coastal and near-coastal areas, mainly in sand over limestone. 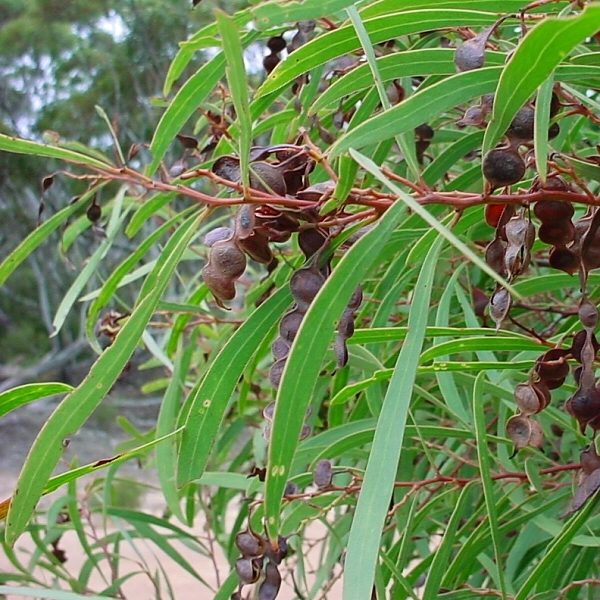 Alcock’s wattle is listed as ‘rare’ for South Australia. The species was described by Bruce Maslin and David Whibley in 1987. 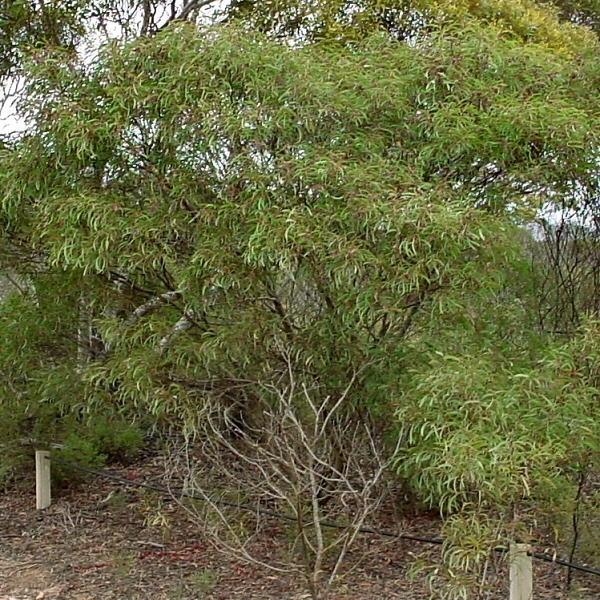 It is a bushy shrub, 2-3 m in height, and can be distinguished from its closest relatives, A. anceps and A. leiophylla, by the combination of racemose inflorescences consisting of small pale yellow globular flower heads, and transverse seeds in the pods (see line drawing from worldwidewattle, below). The wattle is named after Ray Alcock, one of the State Herbariums most prolific collectors, who died earlier this year. Besides A. alcockii, he is also commemorated in the species name Rumex alcockii Rech.f., now a synonym of R. brownii Campb. Charles Raymond Alcock (1921–2015) followed his father’s footsteps into the field of agriculture. Ernest Simpson Alcock was an early (1904) graduate of Roseworthy College, where his son was later to study as a scholarship student. Ray’s childhood was spent on the Kybybolite Experimental Farm in the south-east of SA, where his father was employed as a supervisor. From Roseworthy, Ray left to serve in World War II, later with the RAF in Britain, gaining a DFC for his efforts. Although Ray also gained a diploma in dairy studies from Hawkesbury College and spent his early working in the dairy industry, he turned his attention to plants (and specifically weeds) in the 1950s. Plants and nature conservation became his passion from then until his death, and he became a prolific collector for the State Herbarium, which holds around 12,000 specimens under his name. He joined the Nature Conservation Society of SA in 1964, only 2 years after its formation. He was nominated for membership by then head of the State Herbarium, Dr Hansjörg Eichler. Most of his earlier plant collections are from Eyre Peninsula, where he was employed by Local and State Government as a Weeds Officer for the Eastern Eyre Peninsula Weeds Board / Lincoln Council and the Department of Agriculture. His collections were certainly not restricted to weeds, and early correspondence with the Herbarium indicates that he found a number of plants not previously recorded for the Eyre Peninsula region. In 1971 he was transferred to the head office of the Agriculture Department in Adelaide, where he was employed as an agronomist with the Weeds Section. He was the Local Government Liaison Officer for some time and latterly specialised in weeds identification and advice with the Pest Plants Commission, building up an extensive herbarium of weed specimens, which has since been transferred to the State Herbarium. In his retirement he worked with the State Herbarium as a volunteer and collected widely around Australia during his holiday trips. Plants even extended to his hobbies, as he was an avid and talented wood carver. This entry was posted in The Plant Press on 22 December, 2015 by Jürgen.